Wait, you mean it's not "Flamingo" dancer? We've been wrong all these years?! Just kidding! Of course we know what "Flamenco" is, silly! It's a traditional folk art, music, and style of dance from southern Spain. And from our knowledge, it's got a reputation for being festive, lively, colorful, and infectious to all those who encounter it, immediately making them want to join in, or at least learn to dance or play Spanish guitar. So if you've got a kid who loves to dance and steals the show whenever she hits that dance floor, we've got the ideal getup for her: this awesome Girls Flamenco Dancer Costume! It's bold, colorful, and larger than life, just like someone you know. And best of all, it looks elaborate but is deceptively simple; the costume consists of just a dress and a satin rosette that stays in your little dancer's hair thanks to an easy-to-use plastic comb. The ease of this costume is key, because the trick to being a great Flamenco dancer is making everything you do look incredibly easy and without effort. 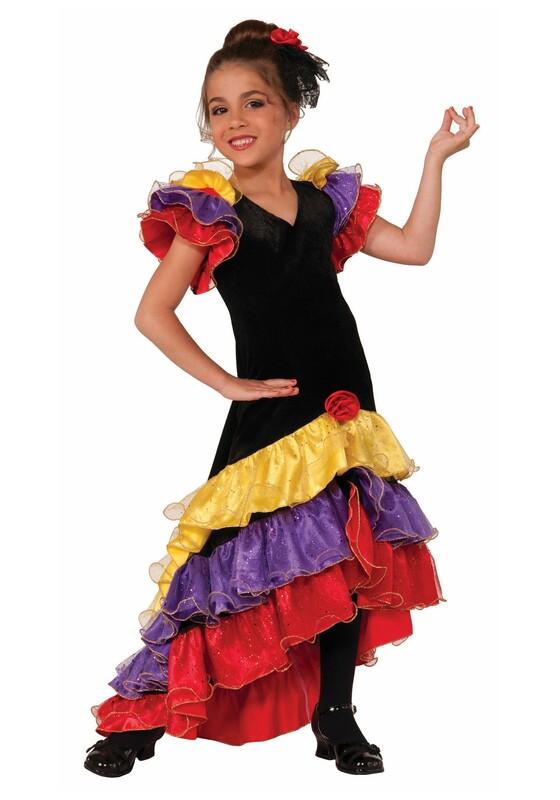 Nonetheless, the Girls Flamenco Dancer Costume is still a highly detailed and richly authentic dress, with tiers of multicolored frills and ruffles in the sleeves and skirt, and the delightfully asymmetric hemline characteristic of the Flamenco style. The dress is a hit at Halloween parties and cultural celebrations alike, and it's sure to make a star of your little Flamenco Dancer!